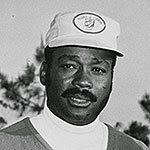 PETE BROWN, THE FIRST BLACK GOLFER to win on the PGA Tour, died last Friday, just two days after Calvin Peete passed away. With a dozen tour wins, including the 1985 Players Championship, Peete was the winningest African-American player until Tiger Woods came along. "I never really got a chance to spend any time with [Calvin Peete], and our paths never really crossed," Tiger said. "I never met Pete [Brown]. Circumstances never allowed that, but Charlie [Sifford] became a grandpa to me, and I named my son after Charlie. "Lee [Elder], obviously, our paths crossed, but for some reason a couple guys throughout history -- Teddy Rhodes, Bill Spiller and all those guys that I wish I would have gotten a chance to meet and a chance to talk to -- I never really got that opportunity." "My struggles weren't, obviously, anywhere near what they had to endure," Tiger said. "I didn't have those struggles when I was trying to get on Tour, but I certainly can relate to when I was a kid, and the things that I had to endure, just to try and play golf. I wasn't allowed to play at certain places. That part I can understand and I can relate to." "I honestly believe that we don't have any African-Americans out here playing on the Tour, or even a lot on the mini tours, is because of the advent of the golf cart," Tiger said. "That took away a lot of the caddie programs and the introduction to the game of golf, so they never got out of the urban areas. They stuck more to basketball, baseball -- even baseball has declined a lot -- football. That's kind of where it all went to. So they never had that introduction, never had the caddie programs during the summer where you'd go out and loop two, carry 36, hit a few balls here and there. At least you got introduced. You got to watch it, simulate it, you got to be around it. That's all gone."